Wow! 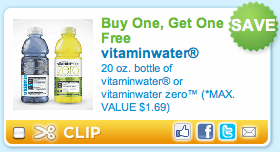 You’ll want to hurry over to Coupons.com…they just released a buy one get one FREE Vitamin Water coupon! Print it while you can–this probably won’t be around for long!